VIDEO: OLR v. Sommers – What Do You Think? 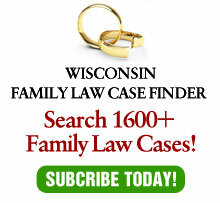 In a previous post, I expressed amazement that the Wisconsin Supreme Court violated its own internal rules to limit discipline in this case to a 30 day suspension. I just received a link to Mr. Sommer’s Web site. Take a look at the video of his SC argument below and let me know how his conduct merits only 30 days – just based on his argument alone! Disclaimer: I serve as retained counsel for OLR in certain cases, but I had no involvement in this case.